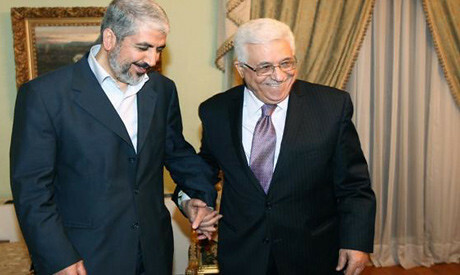 Khaled Mershaal of Hamas and Mahmoud Abbas of Fatah. The reconciliation process is continuing between the two Palestinian parties., a photo by Pan-African News Wire File Photos on Flickr. The statement comes a day after the decision of Egypt's interim government to officially declare the Muslim Brotherhood a terrorist group. Ahmed Assaf, the spokesman for Fatah, said in a statement that the continuation of Hamas's "subordination" to the international Muslim Brotherhood organisation will put millions of Palestinians -- especially those in the Hamas-ruled Gaza Strip--in confrontation with several Arab states, including Egypt. "This will lead to dangerous security and economic situation that will threaten the future and lives of the people there [in Gaza]," Assaf said. Assaf called on Hamas, an ideological offshoot of the Muslim Brotherhood, to prioritise the interests of the Palestinians over other "partisan interests and foreign connections." The Fatah leader said his movement, Hamas's main Palestinian rival, is confident of Egypt's awareness of the fact that Hamas forcefully controls Gaza, and represents a "small part" of the Palestinians living in the Gaza Strip. "Most Palestinians are loyal only to their identity, culture and nation," Assaf concluded. The day saw mass protests in cities around Egypt against the rule of then-president Hosni Mubarak. Titled "The Most Dangerous Terrorism Crime the Country Has Ever Seen," a statement issued by investigative judge Hassan Samir on 21 December accused the defendants of the attempted murder and kidnapping of three police personnel, and of detaining them in the Gaza Strip, along with other charges including possessing heavy weapons, committing aggressive acts, vandalising government facilities and looting "livestock, poultry and weapons" from prison warehouses. The statement also accused the international Muslim Brotherhood organisation of concocting a "terrorist plan" in collaboration with Hamas and Hezbollah "to give up part of the Sinai Peninsula for the resettlement of Palestinians from Gaza." On 18 December, prosecutors released new charges against the ousted president, of "collaborating with foreign organisations to commit terrorist acts in Egypt and revealing defence secrets to a foreign country," also naming Hamas and Hezbollah and running between the period 2005 to 2013. Egyptian Foreign Minister Nabil Fahmy told the London-based newspaper Al-Hayat there was "tension" in relationship with Hamas. He suggested Hamas was not helping enough to secure the border. "If Hamas proves through actions and not words -- and unfortunately there are many negative indicators -- its good intentions, then it will find an Egyptian party that ... protects the Palestinian side," Fahmy said. "These communications had positive implications; chief among them is the opening of the Rafah border crossing every now and then," Naim said in a press statement, adding that he wished for an improvement in "the circumstances, the means and the results of communication." Naim further expressed his hope for a complete and undisrupted opening of the crossing, given that its closure has negatively impacted "everyone and everything in Gaza." On Tuesday, Hamas denied involvement in bomb attack in the northern Egyptian city of Mansoura that killed 15 and injured 134 when a large explosion hit the city's security directorate, causing widespread damage to buildings in the vicinity including the city's council building, a state-owned theatre and a bank. The Palestinian Islamist movement's spokesperson Sami Abu Zuhri said in a statement that the group had no link to this attack or any other in Egypt, and that Hamas condemns such accusation.